Since the day that Ebenezer Gomme set up his first furniture factory in 1898, G Plan has always had the same aim: to create stylish sofas and chairs that offer the highest levels of comfort and quality. Since 1953, G Plan has been a benchmark for classic British design. But what’s made it such an enduring favourite is the way every sofa and chair is built for real life. This is furniture that loves to be lived on. Setting the tone for British furniture making, we have continued to grow and develop and today we are still one of the UK’s biggest upholstery manufacturers. 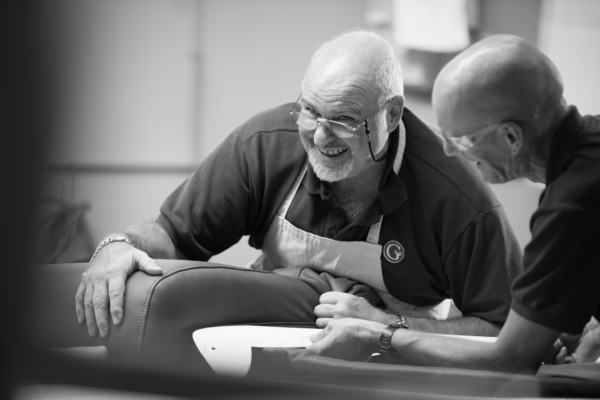 Every G Plan sofa and armchair is crafted in the UK by skilled craftspeople. We want your sofa to stay looking beautiful for years to come, so we go to great lengths to source high quality fabrics and premium leathers that we know will stand the test of time. Every sofa is also super comfy and is designed to envelop and support you every time you sit down. You can rely on us to take care of good design and comfort, but how our sofas fit in your home’s style is down to you. You can choose from a wide range of fabric or leather options, as well as scatter/accent fabrics in inspiring colours and patterns. Explore our fabrics and leathers here. Or read more about G Plan design heritage and our quality and craftsmanship. Meet a few members from our team and see current vacancies here. Registered no: 149073. Registered office: 1, Hampton Park West, Melksham, Wiltshire. SN12 6GU.